I have two loves in the sewing industry, JANOME and fun fabric. You will always find everything you love about JANOME and fantastic fabrics in my shop. I have been sewing something ever since I was a young girl. I had a sweet Great Aunt Orline that planted a seed for my passion during my summer vacations at her home in Glenwood, Mn. When I turned 19 she gave me a beautiful feather weight that sits in my shop today. I pieced my first quilt on the feather weight in my college dorm room in 1990. I have been a fabric-aholic and quilting fanatic ever since. Beyond my love for sewing, I have a large family that I love and cherish too. From time to time you will encounter any one of my family members in the shops helping out. My husband is often fixing sewing machines to help keep you sewing, and my kids might demo a product or ring you up at the register. It is our goal to provide you with current tools and knowledge for all of your sewing adventures. We strive to build relationships of trust and service so that you'll feel comfortable returning to our store again and again...like an old friend. 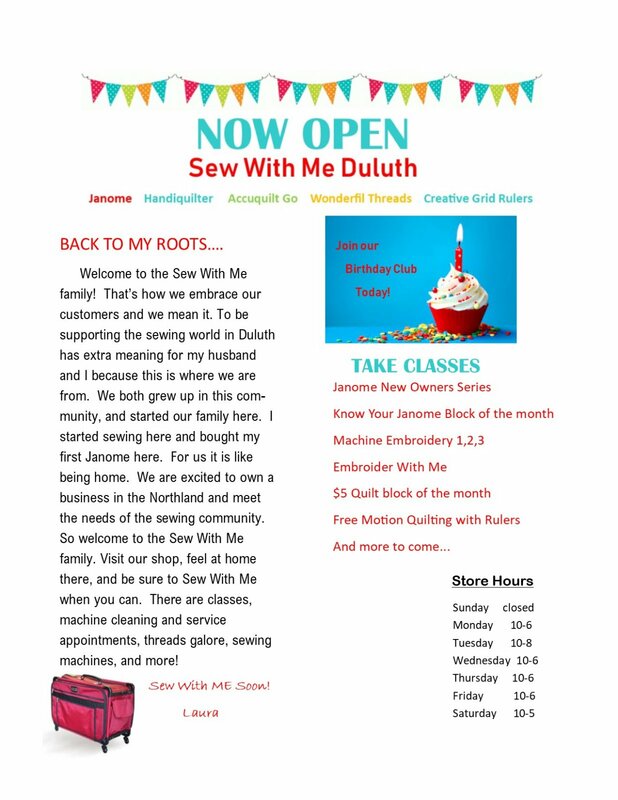 Come Sew With Me Soon!